It all started with the idea to visit the waterfall Maliwan, very picturesque place located close to village Kawthoung. This Myanmar-Thai border town has been my home ever since we anchored the Clan VI sailboat in these waters. After almost two weeks of staying on board and preparing for out first charter, our crew decided it was time to stretch our legs and go for a day trip to the waterfall. We went into the trip blind. We didn't do much or any research so we didn't know where exactly we were going, all we knew is that we wanted to visit waterfall and soak in the clean waters everyone in town has been talking so much about. We met a guide from Myanmar who called himself "Michael" on the pier, and it seemed like he knew the way to get there. Together with our chef Damien, Michael, our driver, and his four and six year old son and nephew, we piled into the three-wheel motorcycle with a sidecar and took off on an adventure across the mainland! Tourism here is almost non-existent. Besides a few expats running back and forth between the Thailand-Myanmar border for visa runs there are extremely few foreigners in the area. On our way to the waterfall our trike struggled up and down the steep streets of Kawthoung. Several moments left me doubting whether the tricycle would manage to get us over the next hill. The slow ride was actually perfect for me to take a better look at the town and its happenings. Everyone was preparing for the full moon festival so the streets were filled with people celebrating, dancing, handing out free food, and pushing around a large, elaborately decorated wheel cart to each of the golden pagodas on the hilltops. The town’s festive atmosphere really lifted our spirits and the children in our tricycle started to giggle and sing Myanmar children's songs. Immediately upon leaving Kawthoung the scenery to changed dramatically; temples, monasteries and street-food stalls gave way to vistas of tall mountains covered by palm and teak tree, and rubber plantations stretching endlessly into the distance. Deforestation for the export furniture industry has sadly destroyed most of the teak trees here. Rubber trees are cultivated in most of southern Myanmar as well as the Ayeyarwaddy Delta and are used for the small-scale production of rubber. We passed many small dwellings and wooden huts on the side of the roads inhabited by plantation workers and their families. The sun was getting stronger and after an hour of driving on the tiny motorcycle we all felt like we needed to rest for a few minutes. We drove to the side of the road and stopped to rest in a place overshadowed by tall coconut palms and small wooden huts built all over a small plot of land. It turned out that we stopped right in front of a large rubber farm. On the sides of the farm white sheets of rubber were hanging on the large bamboo racks, drying in the scorching sun. It was the first time for me to see a rubber plantation so my inner artisan geek exploded with curiosity. Michael saw my excitement and went ahead to see if anyone is home and if we could possibly take a look at their facilities to learn some more about how the rubber is made and what the process looks like. We approached the farm and, bursting out of nowhere, around twenty children started running toward us from all the corners of the farm. At first they were shy and carefully looked at us but when we started to pull out some candy they all relaxed really fast and surrounded us in a small circle. Our guide Michael found the manager of the farm and he came out one of the huts to greet us and show us around the farm. He looked a bit sleepy and we probably just interrupted his mid-day nap but he seemed to be happy to show us around. He put a few betel nut packs in his pocket and one in his mouth to chew on while he was showing us around. It takes three years before rubber trees are ready to be “harvested”. We learned from the farmer that after the wet season is the right time for the latex to be collected from the rubber trees and is best when done early in the morning. Workers start at 1:00 am when the temperatures are low and they go from tree to tree with their lamps to collect the latex. Small cups attached under slices in the trees gather the slow drip of latex juice: that's right, they harvest the tree's blood after slicing it open. After the latex is collected, formic acid is added in order to cause coagulation and preserve the latex. I was overwhelmed by the way people live on this farm, cultivate their rubber trees, tediously harvest the latex sap, and then turn it into the rubber sheets by drying them in the sun and in the smokehouses. It is hard work indeed. For many farmers around this area rubber and palm oil production are the only source of income, but times are getting harder for them because of the competitive prices of latex from other parts of Southeast Asia where Chinese clients prefer the raw rubber that cleaner and where quality control is more tightly enforced. Everyone at the farm was very excited about our visit; they wanted to show us around and give us all kinds of presents like watermelons and pumpkins that we kindly rejected because of the lack of space on our motorcycle on which we already tried to fit three adults and two very energetic children pulling my ponytail in all directions and finding ways to get my attention at all costs. Just when we were about to leave the farm another motorcycle pulled in into the farm’s front yard. It was a honey delivery!! I couldn't believe my eyes when a man on the motorcycle opened his large bag that he fitted between his legs and the luscious golden liquid appeared in front of us. At first I was confused what is this liquid but Michael quickly translated to me that it is honey. 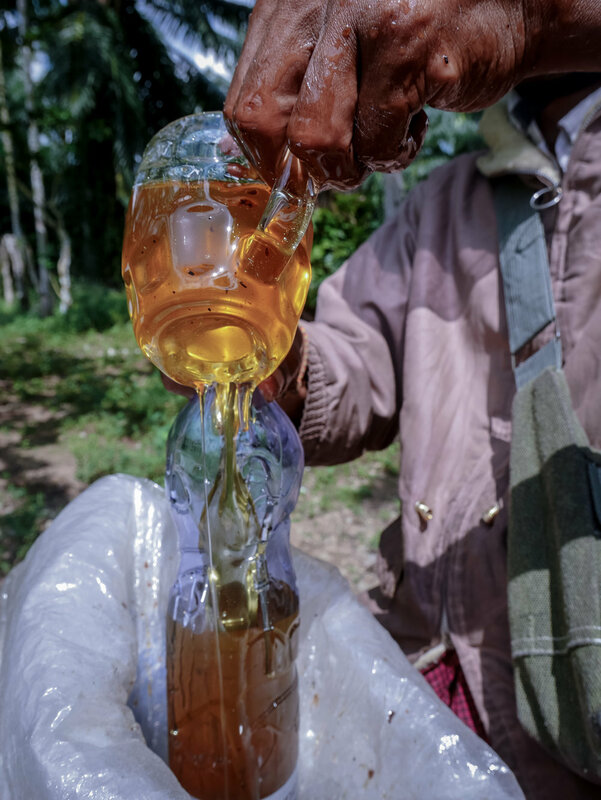 Raw, unfiltered honey in the middle of the mountains of southern Myanmar!! For me this was the purest form of awesome and the experience of a lifetime and no tourist attraction or waterfall could beat that. I was on a quest to learn everything about this liquid gold and tried to find the ways to get as close to this treasure as possible. The honey man (that's what I'm calling him) took a large beer cup he was carrying around and reached deep into the bag. A few seconds later he brought out a cup that was overflowing with the golden nectar and chunks of honeycomb. The honey was clearly unfiltered and as pristine as harvested probably that same morning. He offered it us to taste. First we wanted to share it with the children, but they seemed to be way more interested in packs of Oreo's we gave them when arrived to the farm. Wasting no time, chef Damien took the bold first step, reached with his finger into the cup and pulled it out, dripping with honey. He tasted it and I could tell how his eyes brightened up instantly. “We will take 4 liters please” he said with enthusiasm to the farmer. As much as I know his creative mind, I knew that he was already creating the dishes he would prepare with this honey when we returned back to our boat. Having a pastry chef on board is a special kind of luxury because I get to taste the most amazing fresh-made pastry on a daily basis but it is also a constant battle of self-control. I couldn't resist any longer so I tasted the honey as well. It was delicately scented with fresh-grass and tropical herbs - light and refreshing. My excitement at that time made me realize how rare and beautiful this was. The raw, gentle bitter-sweet taste was so satisfying and my taste buds instantly tried to identify what kind of honey this could be - is it wildflowers or the passion fruit flowers that seems to be growing everywhere? After talking to the farmer it turned out it is mostly palm tree blossoms and wildflowers growing close to the plantations. He found wild bees in the remote corner of his land where they created beehives in the isolated cliffs in the footsteps of the mountains. He started to collect the honey and sell it raw and unprocessed to villagers to earn some extra money on top of the palm oil plantation he was managing in the vicinity. The honey was an unusually bright color for pollen being harvested from wildflowers so the palm tree blossoms must have given the honey brighter tones. Also, the viscosity was to my surprise quite runny - I was expecting more thickness. We were also standing in the middle of the scorching sun, so that may have influenced the texture. For my personal taste the honey was too light because I usually love my honey strong, bitter, and wild, but in any way, it was delicious and the most satisfying thing that could happen to us that day. The chef and I were overwhelmed by this sensational discovery and felt like we just accomplished a huge thing. This is what I love about the food discoveries that happen - this feeling of intense joy that overflows my body and fills me up with energy and excitement for the rest of the week! I want to share this excitement with others so I figure that writing a blog and posting pictures is the best way to implement that. We quickly emptied some water bottles and let him fill them with honey. We then wrapped them with numerous plastic bags and hoped that in a few hours we wouldn't experience large ant or bee attacks along the way. We said goodbye to the rubber-plantation family, promised to visit them at the next opportunity, and hit the road towards the waterfall Maliwan. After our huge honey feast we were really looking forward to jump into the water not only for refreshment but also to clean up. Our hands were sticky and it seemed like everything we carried with us was now covered with honey - to my horror also my phone and camera had honey fingerprints all over their cases. The rest of the approach towards the waterfall was through an unpaved road that skittered up and down a series of hills and valleys. Numerous rubber trees stood alongside the road; the bright sun was giving way to a late afternoon, so workers has already emptied the day’s cups of latex sap, but the white juice continue to drip, forming small puddles in the cups attached to the trees. Shockingly quickly the air around us started to cool down - we knew that waterfall couldn't be far away! And we were right; just around the corner was the Maliwan waterfall and its endless natural pools filled with crystal clean water. We spread out our towels and before realizing what had happened, the two little children traveling with us were already in the water. With no swimsuits, free like little birds they were sure the happiest people I have seen in a while. We were just keeping a really good eye on them so nobody would get hurt and enjoying a swim in this waters as well. It all seemed like a dream until something quite shocking happened; a group of young Myanmar teenagers showed up and to my big surprise they stopped right at the top of the waterfall and starting to empty the trash. Swimming in the pool under the waterfall we slowly started to get surrounded by plastic bags, leftover snacks, water bottles and candy papers. I was so deeply shocked by this behavior that I just froze for the moment. Was this really happening? My mind was trying to decide if I should start yelling at them “What the hell are you doing?” or just quietly observe how nature was being destroyed in front of my eyes. Me not being able to speak Myanmar and them not understanding a word of English there was no point of me making a huge scene. On top of everything, the rest of the visitors at the waterfall didn’t seem to be disturbed by this at all. And this is the core of the problem in Myanmar when it comes to pollution and environmental protection. Nobody cares about the trash, about the air pollution about the water quality, about overuse of chemicals and fertilizers. If nothing changes, the beautiful pristine areas of Myanmar will soon reach the point of over-pollution in all aspects. The evidence is already there. But is there going to be any change soon? Despite this incident that affected me so deeply, the visit of Maliwan waterfalls was incredibly beautiful and worth the trip. In the vicinity there are also hot springs that are on my list to visit next. If you find yourself in this part of Myanmar don’t forget your swimsuits - natural wonders like waterfalls and hot springs are here in abundance!